First off, thank you to our friends, family & fans who came out to support us at Whirled Pies for the 1st night of the Sprout City Studios Battle of the Bands! With your help & vote, we won our round and will be moving onto the Final Showdown! We will perform on July 21st at Hi-Fi Music Hall; doors open at 8pm and the competition will start at 9pm. This event is all ages, and tickets will go for $5 for advanced purchase, and $7 if purchasing at the door. The bands and artists performing with us include: Astro Gala, Fools, and Ryan Gordon. Mark your calendars now and come on out! We certainly appreciate your support! Again, thank you to those who showed up and helped to get us into the Final Showdown. Also thanks to Sprout City Studios for putting this on and Whirled Pies for hosting the first event, and to the other bands who performed, including Libido Cornucopia and NeverEver Band. Tomorrow, July 14th, is going to be our official CD Release Party for our upcoming EP titled, Morning Light. 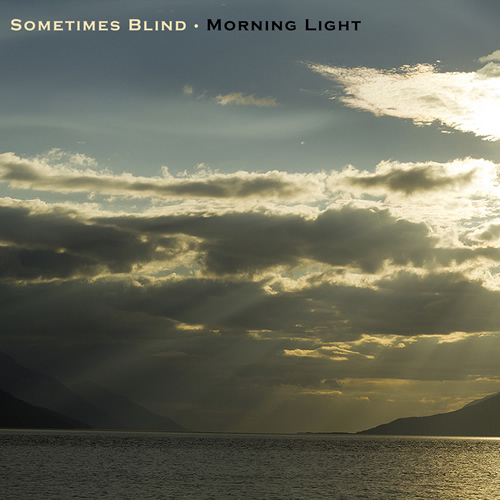 We will have copies of Morning Light available in both physical and digital format. 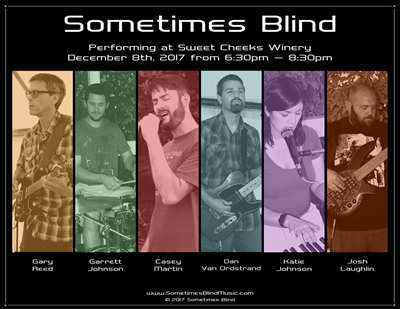 We will also perform an acoustic set, playing from 6pm - 8pm at Sweet Cheeks @ 5th Street Public Market. Address is: 248 East 5th Street, Suite 25 Eugene, Oregon 97401 (View Google Maps) Digital copies of Morning Light will be made available on all major online music stores, including: CD Baby, iTunes, Apple Music, Google Play and Spotify, among others. Finally, we'll be playing at the Lane County Fair's Community Stage, next Thursday, July 19th, playing 6pm - 7pm. The Community Stage will be located in front of the Lane Events Center, on the south side of the building. Click here for map of the fairgrounds. Address is: 796 W 13th Ave, Eugene, OR 97402. (View in Google Maps). Thanks all! And if you like what we do, feel free to drop us a review either here on our website, or on our Facebook page! Just wanted to get out a quick update about some big events going on for us this weekend! First is our return to Creswell Coffee on Friday, 7pm - 9pm. (All ages, $4 cover.) This was such a fun venue to play back in January, and we're looking forward to coming back! It's a smaller capacity, roughly 40-50 people, so get here early to get a good seat. Plus they have a great selection of dinners, desserts, coffees and other beverages! 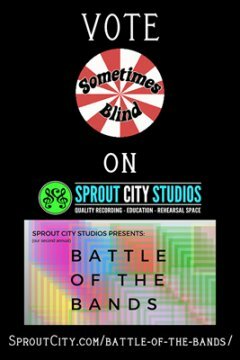 Then on Saturday we will be performing at Whirled Pies in the 1st night of the Sprout City Studios: Battle of the Bands, from 6:30pm - 9pm (all ages, $2-5 suggested donation). This night will showcase 5 bands, with each band playing 3 songs. Register to vote by sending a text message of "SPROUTCITYB457" to "22333", then text your vote on the night of June 16th. We'd appreciate your support and vote! That's all for now. We'll update after the first round of the competition. Just a quick update about the voting contest that I mentioned in the last post. 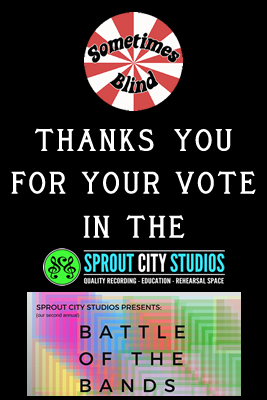 First off, thank you for your vote in the Sprout City Studios Battle of the Bands voting round! 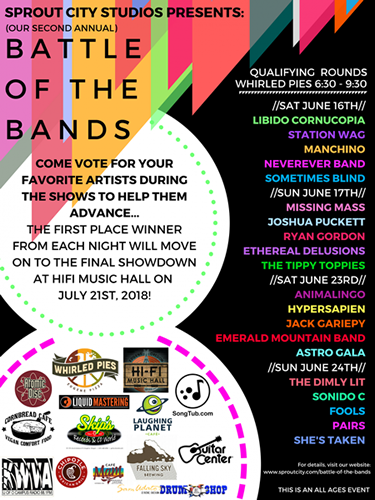 Because of your support, we have gotten into the performance part of the competition, and will play at Whirled Pies here in Eugene, Oregon on June 16th! Our performance night will start at 6:30PM and wrap up at 9:00PM, with each band performing 3 songs. Audience participation is highly encouraged, and will be able to help the judges vote using a free phone app that will be made available closer to the date. The winner of our performance night will go onto compete against the winners from other performance nights, with the final showdown scheduled for July 21st at Hi-Fi Music Hall, which is also located in Eugene. This will be an all ages event, with a suggested $2 - $5 donation at the door. The more of you that come down to help support us will help our chances of winning! I'll post an update after our performance night to let you all know how things went. In the meantime, here's a couple links to our SoundCloud page with some new material that we've been working on in the studio. ("I'm Here" is the song we submitted to the Battle of the Bands contest for public voting.) These songs will be included on our upcoming EP, which we plan to release later this summer! More info on the EP as it becomes available. Quite a bit has happened since the last post in December 2017, so much that it's been a challenge to take time to write about it. But I've got some time here now and figured it would be good to get everybody up to speed. Back in mid December our lead guitarist, Gary Reed, officially stepped back from the band for personal reasons. We appreciate everything that Gary brought to the band during his time with us, and we wish him well on his new endeavors. His mind blowing guitar solos will certainly be missed! 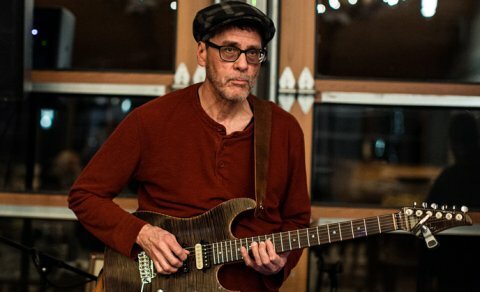 Shortly after Gary's departure, I was reaching out online to some guitarists. After quite a search and some initial responses, I found a guitarist on Bandmix.com who had a very distinct sense of melody within his lead work. Very much a Joe Satriani type of player. I reached out to him, presented our own tunes and what we were looking for. He responded favorably toward our music and said he'd be interested in an initial jam session to see how things felt. Within the first meetup with me (Dan), Garrett and Casey, we knew we had found our guy! 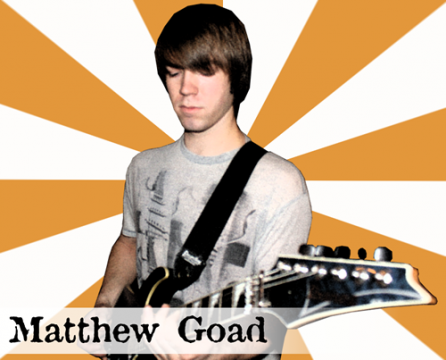 So allow me to introduce our new (as of December 2017) lead guitarist, Matthew Goad! Matthew has played several shows with us now and has filled in quite nicely. He will be featured on our upcoming EP that we plan to release later this year. Which is a great segue into our next bit of news. We have been working on a follow up to our EP that we released August 2017. This will be another 7-song EP, featuring all new material. We have one song finished and posted on our SoundCloud account, which you can check out for an early preview of what's to come. Click here to listen to our newest song titled, "I'm Here". Moving along, we have recently purchased some equipment that will allow us to record our live performances. For those of you interested in recording gear, we picked up a Tascam Celesonic US-20x20. This allows us up to 20 separate inputs that all get piped into our laptop for simeltaneous recording. We can then mix out the recording after the show. This bad boy has a lot of bang for its buck, with a digital mixer, EQ, effects and compression for each channel, and USB 3.0 capabilities. It's quite intuitive, and took us about 20 minutes to go from opening the box to laying down our first recorded tracks. The part that slowed us down the most was my audio software we were using, which is Studio One from PreSonus. With the Tascam 20x20 in our aresenal, we took it for a crash course at our recent show out at Sweet Cheeks Winery back on April 8th. On a side note: our setup for this show was what we call our "hybrid acoustic", which basically means I leave my amp and Telecaster at home and play my Martin acoustic/electric, and Garrett plays on percussion instruments rather than a full drum kit. This setup really helps us to manage our overall volume for places where it really counts. In the midst of everything going on, we happened to also pick up our first bit of press! 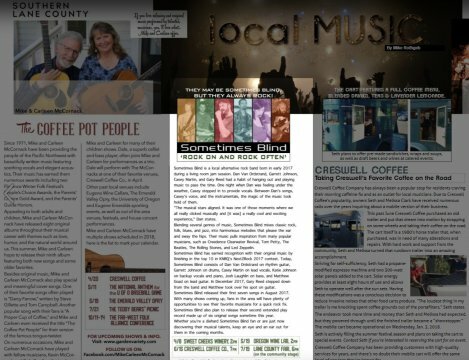 Emerald Valley Magazine, a bi-annual lifestyle magazine covering southern Lane County, emailed us a couple months ago and wanted to run a feature article on us. They published our article in their Spring 2018 edition, with their online version getting published in mid April and their print version going out May 1st. You can click here to view the online version of the article. That's all for now. We've got lots to look forward to as 2018 continues to unfold! I wanted to follow up on the Next2Rock radio contest that I had mentioned in our last post in October. We made it as far as the Top 10 locally here in Eugene, Oregon, but we would not ultimately be named Top Local Winner for the area. KNRQ gave that title to a band by the name of Fortune's Folly. We congratulate them and say that this radio contest was a win-win in our perspective: It gave us a chance to get our name out there into more places. Had we won the Top Local Winner title, then that would've been the frosting on the cake! As for other updates: We have wired up an account with Bandcamp so that we can now sell our music online! If you've been to our website recently, you may have seen this new feature alongside each of our songs. We have made it possible to purchase single songs or a whole album. 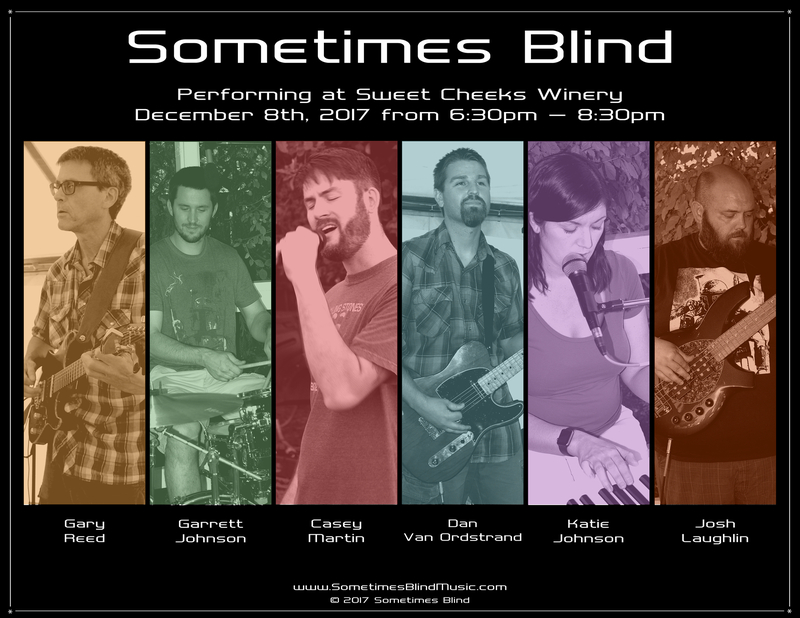 Stop by our website, or Bandcamp page, and get some Sometimes Blind songs to go! We also had a couple of band rehearsals that we recently filmed. We are in the midst of editing videos, but we currently have two songs up and ready for your viewing pleasure! These are two new songs that are will be on our upcoming EP in 2018: 'Dysfunctional Love' and 'Highway Sun'. We've also got an acoustic show lined up at Creswell Coffee Company for January 26th, which will have a $5 cover, and another show lined up for The Axe & Fiddle in Cottage Grove on February 16th. Check out our Shows page for more details on these and other shows as they come up. Click flyer to view larger size. Click here for printable 5x7" flyer.